Black willow is one of the most common tree-form native willows encountered in the Great Plains. As such, it evolved as an important food source and habitat for local and visiting wildlife. Leaves are simple, alternate, deciduous, narrow, lance-shaped, with tapered bases, rounded base, finely toothed margin, blade yellow-green on both sides, with a few small hairs on the lower surface; petiole slender. Flowers of black willow: male and female catkins on separate trees. Catkins are 4-5 cm long, on ends of leafy shoots, many small, yellow-green flowers without petals. Twigs are light-red, slender, and flexible. Buds narrow, conical, orange-brown; leaf scars narrow, crescent-shaped; broad, flat, often shaggy ridges; pith pale brown, small. The bark is dark gray-brown to nearly blackish, divided into deep fissures separating thick, interlacing, sometimes scaly ridges. Black willow is adapted wherever ample soil moisture is found. Black willow grows best where the average annual rainfall is 51 inches, of which 20 inches falls during the growing season, April through August. The estimated lifespan for black willow averages 65 years with a range of 40 to 100 years. The willows are among the first plants to provide honey bees, after long winters, with nectar and pollen. Domestic grazing animals browse in willow thickets. Elk and beaver browse on willow leaves in the summer and willow twigs in the winter. Another willow species well suited to the state is the laurel willow. The ancient Greeks knew the therapeutic values of willow. 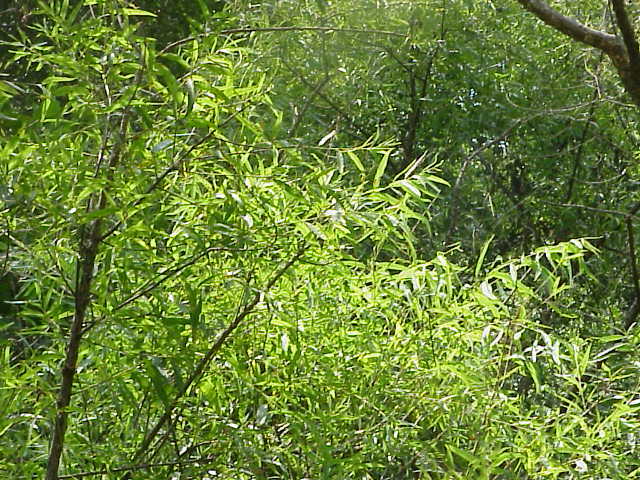 Tea made from willow bark was used for stiff joints and rheumatic pains. By the 1840’s, chemists had isolated salicylic acid from willow and found it produced marked antipyretic (fever-reducing) and analgesic (pain-killing) effects and “striking relief of acute articular rheumatism.” Modern aspirin (acetylsalicylic acid) is a synthetic product. Salicylic acid got its name from Salix.